What’s it mean to be “innovative”? “Innovation” is one of those words that we understand in the abstract or in retrospect—but consider hard to apply in daily life, and in real-time. And how can you discern the difference between real innovative genius (say, the coffee-cup holder in your car console, or Disney’s Fast Pass program) and flat-out silly innovations (I’d put the selfie stick in that category). Last week, Sir Ken Robinson presented a 90-minute video talk and Q&A at MarketingProfs on the nature of innovation in organizations. Sir Ken argued that innovation is critical and imagination is the spark that fuels it. That sounds both vague and high-minded, doesn’t it? But holy wow… it so wasn’t! I’m one of those people who gets antsy at webinars. But last week I was zero percent tempted during Sir Ken’s talk to start scrolling through my email or checking Twitter. Part of that ability to engage was Sir Ken’s delivery: He’s hilarious—in a British dry-humor kind of way. Which makes the big concepts he talks about feel accessible and suddenly relevant to all of our lives. I came away from his talk feeling inspired to do things differently within my own organization as well as elsewhere in the world. When’s the last time that you had that kind of reaction to a marketing webinar? To paraphrase Eliza Doolittle—that ‘ardly hevver ‘appens. I can’t quite capture Sir Ken’s entire talk here… but what follows are 10 highlights. If you’re wanting more, you can watch the entire seminar. “Make innovation part of the daily conversation,” Sir Ken said. 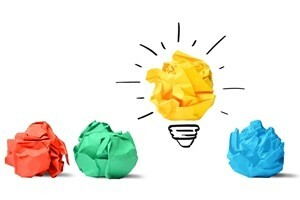 The bigger point is that tools and technologies allow us to channel creativity and innovation in new, unexpected ways. “Innovation feeds on itself. It becomes part of a multiplier effect” in that things are launched that were unanticipated by the original design or intent, Sir Ken said. Innovation isn’t a straight line, in other words; rather, it’s “a kind of conversation, multi-layered and multi-modal,” he said. In 10-20 years, your children will be looking back at pictures of you with your iPad with a patronizing smile. Because we’re moving in a different direction: Technology will merge with human intelligence. The notion of enhancing our intelligence by integrating tech with our brains isn’t far-fetched. It’s the future. Organizations are mortal: Most last only 30-40 years. And they don’t survive if they don’t evolve. One good example is Kodak. It invented the brownie camera, which Sir Ken called “the iPad of its day.” The Brownie camera made photography accessible to everyone, and as a result Kodak went on to be the dominant force in photography. Now the company is in receivership. Kodak didn’t fail because people stopped taking photographs: We take more photos now, not less (“an irritating number,” Sir Ken in a mock grouse). Rather, Kodak failed because it didn’t adapt to a digital culture and instead bet its future on film—”when things really went quite differently, of course,” Sir Ken said. Kodak was created by chemists and it was run by chemists. That, Sir Ken speculated, might’ve contributed to a kind of innovation blind spot at Kodak. “Kodak created a habit of mind, a culture that stopped them from innovating,” he said. There are 7 ½ billion people in the world—more than any other time. By the middle of the century, there will be an estimated 9 billion. Much of the population growth is expected to come from emerging or developing economies. That may affect the future of your own organization. But, more broadly, it’s also likely to affect our collective futures. More people means more need for food, fuel, and water. Beyond the question of whether our planet can handle the growth is the question, “In what fashion?” Sir Ken said. If we all consumed resources as most people do in India, the earth could sustain 15 billion people, he pointed out. But if we all consume fuel, food, and water as we do in North America, the earth could sustain only a mere 1.5 billion. “Which means that by the end of the century, we’re going to need another 4 or 5 planets to accommodate us all,” Sir Ken said. Innovation is the drive to find new ideas and new ways of doing things, to launch both new products and better processes. “But you can’t go straight to it,” he said, because the foundation for innovation consists of two things: Imagination and creativity. Imagination gives you the freedom to consider alternative views. Creativity is about applying imagination to existing systems—to challenge what we take for granted. It’s the process of figuring out if your imagined, original ideas have value. “Creativity is the applied wing of imagination,” Sir Ken explained. And innovation comes from the application of that creativity in an organizational context. “Creative” does not equal “artistic.” You can be a creative team leader or a creative scientist or a creative marketer—which means only that you look for new ways of doing things. We all have creative capacity. But most organizations don’t give people permission to be creative. Pixar bans no or but during company meetings. Great ideas aren’t accidental; rather, they come from a practiced point of view that encourages new ideas and innovation. Support a “yes and…” brand of improvisation at your own organization, Sir Ken said. In comic improv, the actors accept what those around them suggest and work with it: You accept what you’ve been given and build on it, saying yes and instead of no or but. If you’re a creative leader, he added, it’s not your job to have all the great ideas. Instead, it’s your job to allow those you lead to contribute their own creativity. “Take that weight off yourself,” he said. That’s how Sir Ken described his approach to the second edition of Out of Our Minds: Learning to be Creative, originally published in 2001. The second edition came out in 2011. I’m including this quote here only because it made me laugh. Sir Ken ended on an even broader note, putting the notion of innovation into an expanded context. He challenged all of us to work on solving some of the very real social, international, and ecological problems of our planet. “It’s not the cats and dogs and lemurs that are creating problems on earth—it’s us,” he said. And so it follows that it’s up to us to also solve those problems, to sustain both our own lives and our planet’s: The problems our world faces don’t belong to other people or other businesses or other cultures; rather, they are the responsibility of us all. “It’s up to us to not just sustain but enrich the physical environment we are part of,” Sir Ken concluded.